Do you have a great website idea but getting the project started feels a bit overwhelming? What if you could join forces with other talented women and grow that site faster, with less stress? That's what Gianna Kordatzky of FamilyFunTwinCities.com did. She reached out to two other moms with similar sites in her area, and they came together to form a new site that's become so much more popular and effective than any of their sites did on their own. What could you accomplish if you assembled a great team? 03:19 – The Little Email that Led to a Big Site! 08:13 – Does a Collaborative Project Mean Ditching your Own Ventures? 24:32 – How Much Does it Cost to Run a Site About Family Fun? Gianna and her husband both grew up in small towns, so they never expected to raise their kids in an urban area. As the years progressed and they realized they weren't going anywhere, they decided to truly make the Twin Cities their home. Gianna started a website called Twin Cities Family and used it to figure out what fun things there were to do around town. The Little Email that Led to a Big Site! Two years ago, Gianna was part of a group called Blogging Your Passion by Jonathan Milligan, and he encouraged everyone to connect with others in their niche. Gianna knew of two great sites that kept coming up on Google when she searched for family activities in the Twin Cities. They were FreeFamilyFun.com and TourMoms.com. She thought that the women running these sites were doing a great job. Gianna still remembers the day when she typed out in the Facebook group comments, “I don't have anything to offer them.” Jonathan responded that you don't know if you have anything to offer or not until you reach out and see. So Gianna sent an email to the ladies who ran each of these sites and introduced herself and asked if there was a way they could work together to promote each others' sites. Joy who ran Free Family Fun was enthusiastic and wanted to meet. Anne who ran Tour Moms was excited but wasn't able to come to the first meeting. Gianna , who's usually a leap-first kind of person, was actually quite hesitant at first because she felt like she didn't know the other ladies yet. 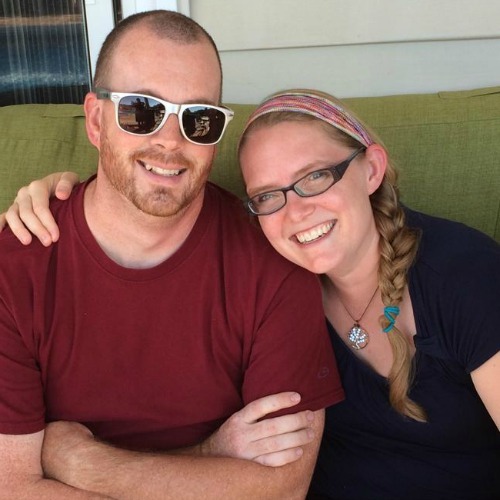 She gave them an honest answer: “I don't know, let me think about it.” For a month she kept milling things over and asking her husband the same questions a thousand different ways. Then she finally came to the conclusion that it doesn't hurt to try. Gianna got in touch and thanked Anne and Joy for their patience and said, “I think why not – let's do this.” FamilyFunTwinCities.com was born in the Spring of 2013. The collaborative site has grown a lot in the past two years. Some days they get more than 2600 hits. On their own, each lady got no more than 500 hits per day on their sites, if that. So together, their effort has led to way more than what they could have accomplished alone. Does a Collaborative Project Mean Ditching your Own Ventures? We were curious about what happened to each woman's individual blog after FFTC was born. Gianna says that they each kept their own blogs for a while. Gianna mostly sent people over to FFTC and Joy of Free Family Fun did something similar. 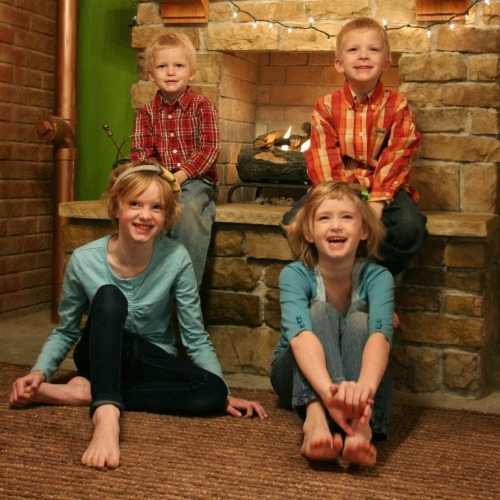 Anne still has her site, TourMoms.com, but she's changed the focus a bit to just cover the fun things she does with her family and refers people over to Family Fun Twin Cities as well. It's great, though, that each woman was able to decide on her own time when and how to transition her own projects. As Gianna said, it doesn't hurt to try, and by slowly transitioning out of their own projects, they gave themselves plenty of time to see if the new venture would work. The FFTC ladies generally communicate via a private facebook group that's just for the three of them. They generally meet in person about every three months but have recently decided to get together more often. Gianna says the group has been really blessed to have three ladies who each have different gifts and personality types. Joy is great at keeping things organized. She does the activities calendar for the site, which is its biggest pull. She also works on administrative and behind-the-scenes tasks. Gianna says that she and Anne quickly realized how gifted Joy is at the calendar when she went on maternity leave and they volunteered to take on the project. It's a lot of work, but Joy does it skilfully! Anne is the best writer of the group. Her posts on FFTC are the most popular and get the most hits, so she's the main content creator for the site. Gianna is the most outgoing, so she loves to meet and connect with business owners and help promote the site. Because their differing roles fit their natural talents so well, everyone feels like they're doing what they were meant to do. And they each offer encouragement to each other when things get tough. With three creative women working together, there are bound to be differing opinions from time to time. Thankfully, Gianna says that they've never had a disagreement where someone's feelings got hurt or anyone was accusing of someone else. There have been 1-2 instances where someone had to speak up to make sure everyone is aware that there is someone in the group who doesn't feel comfortable with the way a decision is going. As a whole, Gianna, Joy, and Anne work really hard to understand each other's points of view. Gianna gave an example of how they worked through differing opinions in the past. A company wanted to use the services of FFTC and pay them a minimal amount. At the time, Gianna's family was struggling financially, and all she could think about was that they were going to get money and they need to say yes. Anne and Joy felt that this joint venture wasn't a great fit and would take away from their site. Gianna countered with: “this is an income generator and we need this.” Later, she realized that she wasn't trusting God through things, and with time, she was able to look at the situation in a new light and realize that Anne and Joy were right – the venture wasn't a good use of their time and resources. Keep talking it out. Don't force a decision to be made until everyone is comfortable with it. Synergy is real! If you add up what Gianna, Anne, and Joy accomplished on their own sites compared to what FFTC accomplishes now, they're at way more than triple the traffic and value. Working together has produced a much stronger site and brand. Fun, family experiences. The ladies of FFTC get to do all sorts of fun things for free! Recently, a company in Minnesota asked them to come ziplining and review them. Of course they said yes and had a blast! They also get to meet local authors and business owners which is just so fun. The FFTC Birthday Party. FFTC has a Birthday party to celebrate the site's anniversary each year. This year, 100 families are expected to show up. Readers get to come hang out with them in real life and do fun activities to celebrate! Gianna just loves connecting with their biggest fans – the moms who are first to comment on their posts and Facebook page – it's great to provide them with awesome real-life experiences too. 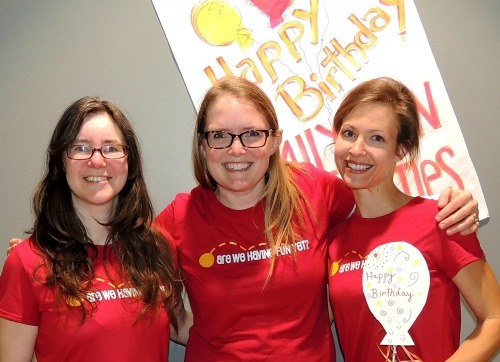 The Family Fun Twin Cities Team: Joy, Gianna, and Anne. Figure out what you can comfortably do with your kids and family. Which activities will work well for you? Which of your kids can you take and which kids might need to stay home? Plan ahead so you're ready to take on the fun! Take Lots of Photos. Even if the photos are horrible and blurry – some photos are always better than no photos. People want to see the experience you had. (If you can take better than blurry, bad photos – then of course, that's great!) Don't forget to bring your camera and capture some memories. Reach Out to Other Moms. It's a lot more fun to run a site like FFTC with other people. If you hear about an awesome play you want to check out but you can't because you're busy that night, then you can throw it out to your partners and see who wants to go. Sure, it's scary to start a site like FFTC, but you can hide behind your computer when you make the ask. The other moms won't know how devastated you'll be if they say no! Just hit send and remember that it'll hurt more to NOT reach out than to reach out and perhaps be rejected. You'll never know until you try! How Much Does it Cost to Run a Site About Family Fun? Before they came together to form FFTC, Joy used to do only activities that were free because her site was FreeFamilyFun. Anne didn't spend her own money all that much either. Gianna just paid for things on her own and wrote about them on her blog. Once FFTC was formed, though, Gianna felt the weight of not letting the other women down and keeping their budget low. Since the site was so much better with all three of them working on it, she wasn't afraid to reach out and ask to review events or get tickets for free. 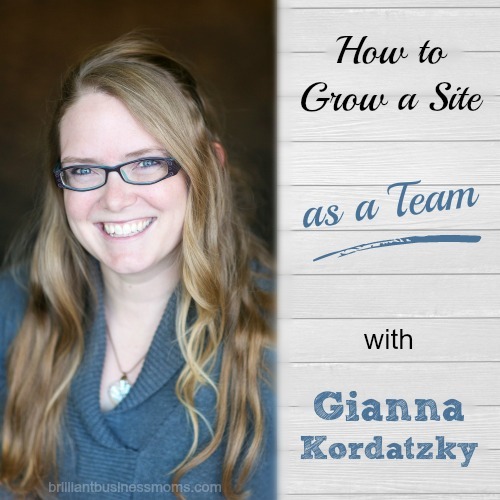 Gianna approaches businesses with confidence by letting them know what they can offer in terms of a review and site traffic, and she's confident that they'll do an awesome job! Because of this, FFTC has been able to do every activity they've wanted to do for free! She's very grateful for all the businesses that have supported the site – even down to getting the venue and entertainment for the site's Birthday Party for free! FFTC is currently working on three forms of monetization. Ads. They finally put Adsense on their site once they did some research and realized that the ads should mesh well with the focus of their site. They're also working on adding another ad network. Affiliate Marketing. Gianna would love to set up a hub where people could buy tickets for local events on their site, and FFTC would get a commission. Families already visit their site for the events calendar, so it'd be that much more convenient for them to grab tickets to all their events in one place too. Sponsors. They're reaching out to more companies and businesses who want to be sponsors and then be included in their posts, on their newsletter, and on their calendar page. The women of FFTC have slightly different goals for the site, but because their big goal is the same, it works out just fine. For example, all three women want the site to be successful and become the one-stop shop for families in the Twin Cities. At a lower level, their goals are a bit different. Joy views the site as more of a creative venture. She has a full-time job already, so while she would like income from the site, what she needs most is a creative outlet, and FFTC provides that for her. Gianna and Anne both love working on the site as well, but making an income is a more important goal for them. Even though they've been lucky to get to do so many great, free activities, they'd like a monetary return on their investment of time. All three women love that the site is able to help families and they get to know new people in the Twin Cities all the time. As it continues to grow, everyone's goals should be met! Gianna, Anne, and Joy did not make their partnership official for quite some time. They worked on FFTC for a year before they decided whether or not to make things official and continue on with the site. Once they saw that things were going well and they all wanted to continue, Anne's husband, the business guru of the bunch, set the ladies up as an LLC. Listen to the full episode to hear what Gianna's youngest is doing these days! Stay in Touch with Gianna! More episodes bloggers don't want to miss. « Announcing… The Brilliant Business Planner!